Co-production: Theater im Pumpenhaus, Münster. When we think about the relationship between “Man” and “Machine”, we normally see the “Machine” as sophisticated, but still inferior to human capabilities. Even now, when robots are becoming very smart, in many aspects they still won’t be able to compete with the human creative mind. Nikolay Panafidin creates small “machines”. They are not robots, but kinetic sculptures. Nikolay Panafidin’s objects are like a constantly moving arms and when you watch for a while, you realize that not one movement is the same and might not ever be the same. The kinetic and mechanic principles that drive the movement seem to create a sense of ultimate freedom. How does this relate to what we do, as dancers? Are we able to create movement that is never the same? When dancers improvise they try to achieve a state of “freedom”, but while doing so they immediately run into the limitations of the human mind and body and movement will be generated out of what we know, rather than from entering into what we don’t know. The kinetic object has no mind, no history, no knowledge, but still it is able to create movement that (probably) never repeats itself: with every movement it enters into the unknown, like a theoretical model for ultimate freedom. 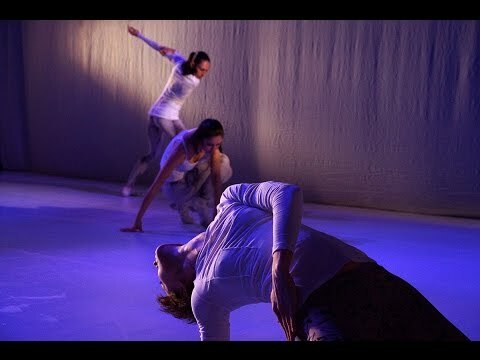 By putting both these options on stage, maybe the choreographer is inviting the viewers to reflect on the limitations of human freedom or maybe to discover that we can learn from a “machine” created by a creative human mind. A Theoretical Model of Ultimate Freedom is nominated for the National Theater Award “Golden Mask” 2017.